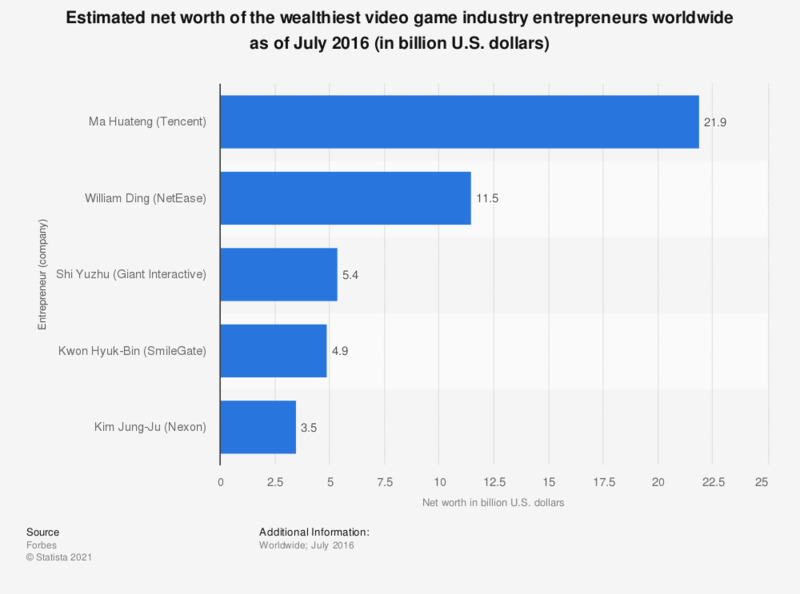 The graph shows the estimated net worth of the wealthiest entrepreneurs in the video game industry worldwide as of July 2016. According to the source, Ma Huateng, the founder and chairman as well as CEO of Tencent, was worth 21.9 billion U.S. dollars in the measured period. Overall, Tencent reported 70.84 billion Chinese yuan revenue from its online games in 2016. Tencent is famous for expanding its operations, and so it comes as no surprise that the company spends millions of dollars on acquisitions of many international gaming companies. As of June 2016, Tencent invested over 700 million U.S. dollars combined in Epic Games, Riot Games and Activision Blizzard.